Liberty Style Geometric Printed Cotton Fabric 152cm/60"
In a stunning Colour with a very good drape. 4 Way Stretch Lycra. · Ø ARTS AND CRAFTS. · You will get one continuous piece as material is cut directly from the roll. · Ø DRESSES / PARTY WEAR. · Ø CLOTHING / FASHION. 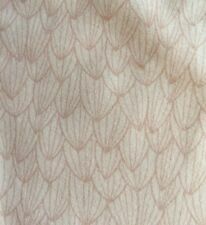 High quality stretch viscose jersey printed fabric. · You will get one continuous piece as material is cut directly from the roll. · Ø DRESSES / PARTY WEAR. You will get one continuous piece as material is cut directly from the roll. Beautiful Smooth Drapey L/Weight. Ideal fashion fabric. Print in Stunning Blue-Yellow. Excellent material for various uses. Smooth Drapey Diamonds print. Stunning Orange/Navy Colour. You will get one continuous piece as material is cut directly from the roll. Ø DRESSES / PARTY WEAR. Excellent material for various uses. Stunning Circles Designer Print. Lightweight Drapey Liquid Satin Dress/Crafts Fabric. You will get one continuous piece as material is cut directly from the roll. By The Yard. Ø DRESSES / PARTY WEAR. Polyester Satin Material. Ø SCHOOL & COLLEGE COURSES. Ideal fashion fabric. You will get one continuous piece as material is cut directly from the roll. Excellent material for various uses. Ø ARTS AND CRAFTS. Floral Liberty Style Printed Cotton Fabric Black or White 152cm/60"
Fine woven fabric, soft touch matt finish with high drape properties. Colour is two tone royal blue and contrast white. 100% Polyester. Eye catching print with tribal inspiration. 80gsm in weight. On Trend fabrics specialise in fashion fabrics and trims for dressmaking. Stunning Orange/Navy Colour. You will get one continuous piece as material is cut directly from the roll. Ø DRESSES / PARTY WEAR. Excellent material for various uses. The fabric has smooth soft feel with a good drape making it ideal for dressmaking and crafts. · You will get one continuous piece as material is cut directly from the roll. 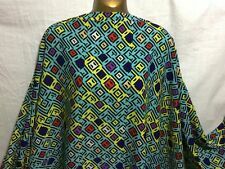 Polyester African. Beautiful Smooth Drapey L/Weight. 100% Polyester Microfiber. You will get one continuous piece as material is cut directly from the roll. Ideal fashion fabric. Beautiful Smooth Drapey M/Weight. Excellent material for various uses. Ø DRESSES / PARTY WEAR. Olive Base -MultiColour. You will get one continuous piece as material is cut directly from the roll. Fine Polyester. Beautiful Smooth Drapey L/Weight. Ideal fashion fabric. · DRESSES / PARTY WEAR. Excellent material for various uses. 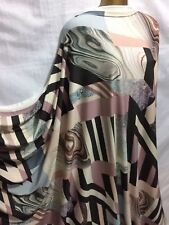 Smooth and flowing lightweight chiffon in a beautiful striking print. Smooth Drapey chiffon. · You will get one continuous piece as material is cut directly from the roll. · Ø DRESSES / PARTY WEAR. 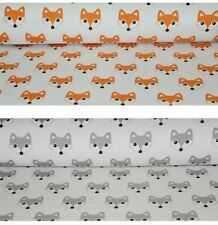 Forest Animals cotton fabric width 160 cm / 63"
Your fabric will be cut in one continuous piece. Fox black and yellow fabric width 160 cm / 63"
Wool Acrylic Mix Green & White Fabric 157cm-62"
100% polyester georgette - sheer and lightweight. Machine washable. I hope you enjoy browsing through my range of fabrics. About Bumble Bee Fabrics. 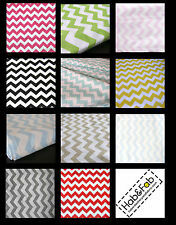 Width of fabric - 150 cm/60" approx. Navy blue Greek key repeating design on a soft cotton spandex rayon jersey blend knit. Fabric has a nice drape and soft hand, and is mid weight with a 4 way stretch. Content: Cotton Spandex Rayon Blend. Collection station availableColour: BlueMaterial: JerseyWidth: 60"
Width of fabric - 150 cm/60" approx. Machine washable. I hope you enjoy browsing through my range of fabrics. Suitable for many uses, dressmaking, crafts, scarves, cushions, light interior uses. Suitable for many uses, dressmaking, crafts, scarves, cushions, light interior uses. Machine washable. I hope you enjoy browsing through my range of fabrics. A modern bandana design with flowers and paisley in white on a deep navy blue colour background cotton rayon spandex blend knit. Fabric is soft, light weight with a 4 way stretch and nice drape. A versatile fabric that is great for many uses. Collection station availableColour: BlueMaterial: Knit FabricWidth: 60"
Collection station availableColour: MulticolouredMaterial: Knit FabricWidth: 60"
Amazing print! Hacci sweater knits are on trend and sew up like regular knits! Content: Poly Spandex Blend. 100% polyester georgette - sheer and lightweight. Machine washable. I hope you enjoy browsing through my range of fabrics. Width of fabric - 150 cm/60" approx. A super soft, modal cotton rayon spandex blend knit fabric in white with a mod geo design in fun colours of pink, magenta, yellow, and mint green. Fabric is light to mid weight, with a soft hand and good drape, 4 way stretch. Collection station availableColour: PinkMaterial: Knit FabricWidth: 60"
Fine Quality Printed 100% Polyester Fabric. You will get one continuous piece as material is cut directly from the roll. Smooth And Drapey. Ø DRESSES / PARTY WEAR. Excellent material for various uses. You will get one continuous piece as material is cut directly from the roll. Fine Polyester. Beautiful Smooth Drapey L/Weight. Ideal fashion fabric. Excellent material for various uses. Ø DRESSES / PARTY WEAR. Small Dogtooth Print in Stunning. Auburn-Rusty Brown Colour. You will get one continuous piece as material is cut directly from the roll. Fine Polyester. Beautiful Smooth Drapey L/Weight. Ideal fashion fabric. Predominantly green in colour with contrasting red and ivory patterns running in line with the selvedge. Unusual border edge printed fabric with central focal point to the design running down the middle of the cloth. Material: Lawn Cloth/Cotton LawnWidth: 61 - 71"
Care instruction: machine washable 40 degree, tumble dry, dry cleaning. Lovely cotton jersey fabric is ideal for making any adults or kids clothing such as leggings, t-shirts, hoodies, dress, skirt and more sewing projects. Fabric has a nice drape and small stretch, light to mid weight. Content: Cotton Jersey Rayon Blend. Weight: 180 g/m2. Suitable for many uses, dressmaking, crafts, scarves, cushions, light interior uses. REMNANT - 68 CMS. 100% lawn cotton. Machine washable. I hope you enjoy browsing through my range of fabrics. 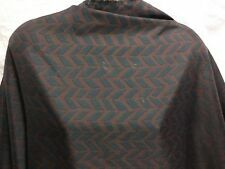 Colour: GreyMaterial: 100% CottonWidth: 60"
Cool mod style diamond triangle squares design in grey and black on a ivory, off white colour background cotton spandex rayon blend knit. Fabric has a soft hand, 4 way stretch, a nice drape, and is light to mid weight. Colour: GreyMaterial: Knit FabricWidth: 60"